You can listen to 'Rose tattoo' here. It's near twelve years ago that I was introduced to Dropkick Murphys. 'Sing loud sing proud' was a great pub-punk-rock-folk album that was so much fun to listen and to sing along to. Since then I saw the band play, watched the audience go completely crazy. But the last show I saw was lacking energy. It was obviously that the band was happy to go home and vocal chords, especially those of Al Barr, were hanging on by the last thread. When the next album was called 'Going out in style' (2011) and not their best to date, I started to fear the worst for Boston finest. And so it's always a good thing to be surprised. 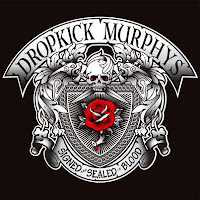 Signed and sealed in blood is a return to true form for Dropkick Murphys. A good album by the band has a few characteristics that are telling all. The listener is as it were transposed to an Irish pub on sing-a-long night. He is presented with songs that lead to great enthusiasm, mixed with some melancholy for days long gone and a spattering of Irish traditionals sped up for modern consummation. Like the 'End of the night' says: "We ain't going home", although we know we have to at some point in time, but please not now. This is what a good Dropkick Murphys album does to a person. But Signed and sealed in blood is not an average album. There are some changes to earlier work. The tempo on the whole is down, or so it feels at least, which allows for more Irish songs played in the traditional way. The bagpipe, accordion, mandoline and tin whistle are a little more in the foreground than the electric guitar. Al Barr is singing differently. He mainly sings in a low register, leaving the over enthusiastic tones to Ken Casey, who's voice seems better equipped to deal with the loud shouting variety in the long run. There are still a few good old punk songs like 'The boys are back', 'The battle rages on' and 'Burn', but with a song like 'Prisoner's song' Dropkick Murphys shifts a little in the direction of The Pogues, but has more, unpolished energy that is unleashed on the listener. 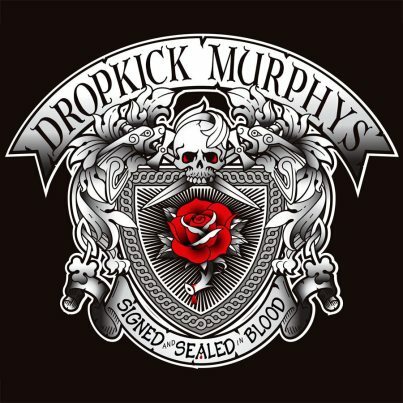 All this makes Signed and sealed in blood a more diverse album than Dropkick Murphys ever delivered before and makes it a better band. When the songs delivered are of a high quality also, even more points are scored all around. 'Rose tattoo' is a great song, that will have many a fan singing along in a very loud way. The quality and diversity is maintained up to the final late night anthem that ought to challenge André Hazes' 'De hoogste tijd' for closing time song in all pubs, as it is sung from the pub-tigers' vantage point and not the publican's. A fine ending of a Dropkick Murphys show is predicted here. Perhaps the cover of the album is a the last sign how good a Dropkick Murphys album is. Another one with a cover worth a mural painting and if you are so inclined a tattoo, Signed and sealed in blood's is. Sing it loud and sing it proud, gentlemen. You've delivered another great album that deserves to be listened to far and wide. Hope to see you live somewhere this year!